Dan started working on this cool Turbo Hardtail some 2 years before we even met him, 1,500 miles from our shop. He came to see us and after the better part of a year, he decided to let us finish the project! We wanted to make this the cleanest turbo ever... not an easy task with the hoses and wires required to get the system to fly! So Herb and I put our heads together and after much thought, we decided to mount all the turbo related hardware (Fuel pump, Regulator, etc) behind the oil tank, and run hard lines up and through the backbone to make it all invisible!! Other challenges included doing away with the ugly hose clamps that held the complex exhaust and intake plumbing together, getting forward controls to clear the turbo and doing away with the ridiculous air cleaner assembly that comes with the Aerocharger Turbo kit (By the way... they are out of business so no help was coming our way on how to make this work!!). 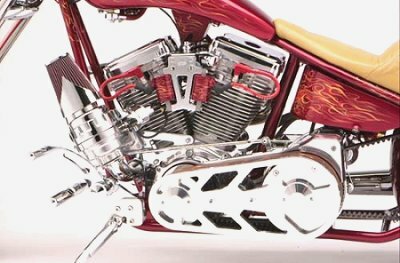 The paint had to be perfect, so Dan called on Chris Cruz Artistry to handle that detail. 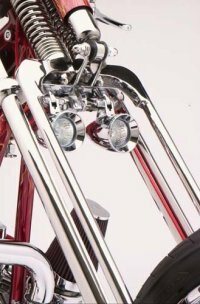 We had discussed that we wanted something that would accent the fact that the bike had a turbo... that is about all the direction Chris needed... He came up with this awesome scheme, laid it on perfectly and then painted the belt to match. Folks freak when they see the belt!!! 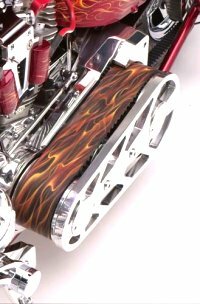 The paint is much more of a fire paint job than a traditional flame job. 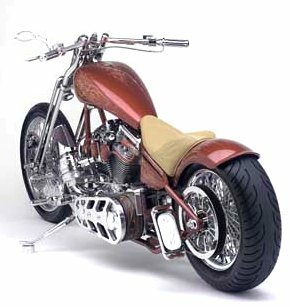 It worked because this bike won the Lustre Lace award at the Easyriders Invitational show in Columbus OH in February '04. Now for the good part... This is BY FAR the fastest V-twin I have ever driven... It starts super easy, but twist the throttle and it will scare you... Right at 160HP at the rear wheel out of 96 Cubic Inches... This baby Rocks!! Look for Dan and Turbulent in Easyriders sometime in '04... Michael Lichter, Arguably the best motorcycle photographer on the planet, took these and a few hundred more shots like them for the Mag. Shot for Easyrider, 3rd place in class at the Rat's Hole in Daytona... I guess Dan's patience worked out... Whaddaya Think?? ?